The markets continued in rally mode last week rising mainly on growing optimism surrounding U.S.-China trade talks. 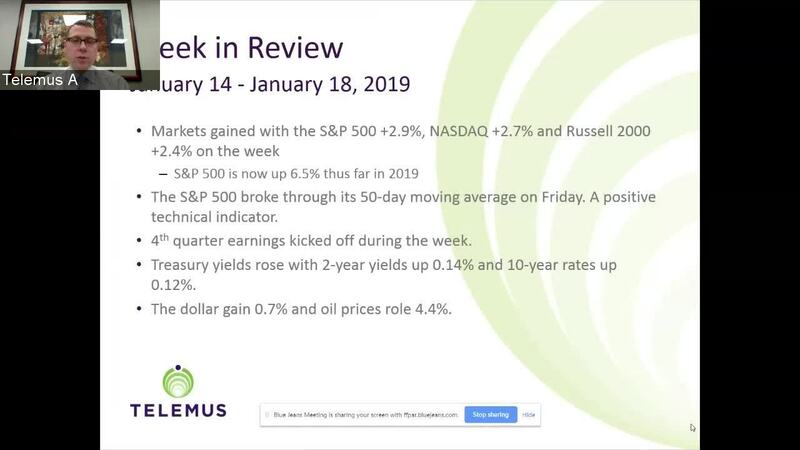 For the week the S&P 500 gained 2.87%, the Dow Jones Industrial Average 2.96%, the Nasdaq Composite 2.66%, and the Russell 2000 2.43%, increasing their monthly gains to 6.54%, 5.91%, 7.87%, and 9.93%, respectively. 10 of the 11 S&P 500 sectors finished last week higher with the heavily weighted financial sector rallying on bank earnings. Conversely, the utilities sector was the only group to finish in the red for the week in reaction to an increase in Treasury yields. The strength from the financials had the S&P 500 butting up against its 50-day moving average for the first time since early December. Then on Friday positive sounding trade reports from The Wall Street Journal and Bloomberg boosted an already improved investor sentiment and helped the benchmark index end the week above its 50-day moving average. The Wall Street Journal indicated that Treasury Secretary Mnuchin proposed to lift tariffs on some, or all, Chinese imports during negotiations. Meanwhile, Bloomberg's report indicated that China made an offer during trade negotiations earlier this month to boost the amount of U.S. imports, resulting in balanced trade with the U.S. by 2024. Though the Journal's report was refuted, investors were encouraged by the tone of the headlines, which fed hope that both sides are intent on avoiding a trade scenario that would be detrimental to both economies. In other earnings news, Citigroup, JPMorgan Chase, Wells Fargo, Morgan Stanley, Delta Air Lines, and Netflix all disappointed investors with worse than expected fourth quarter results and/or lower forward guidance. Conversely, UnitedHealth, American Express, and United Continental provided better than expected results. U.S. Treasuries sold off last week amid the extended gains in the stock market, driving interest rates higher across the curve. The 2 year yield rose 14 basis points to 2.61%, and the 10 year yield rose 12 basis points to 2.78%. In other markets the U.S. Dollar Index gained 0.7% to 96.37, and WTI crude rose 4.4% to $53.84 a barrel. Overseas news continued to be dominated by Brexit concerns. The British Parliament voted against PM Theresa May's deal this week, and Ms. May survived a subsequent no-confidence vote. Both outcomes were expected and as a result produced little impact on U.S. or overseas markets.